Transatlantic Cruise from New York to Southampton with Sunway and Cunard. Queen Mary 2 is Cunard’s flagship and the most magnificent ocean liner ever built. 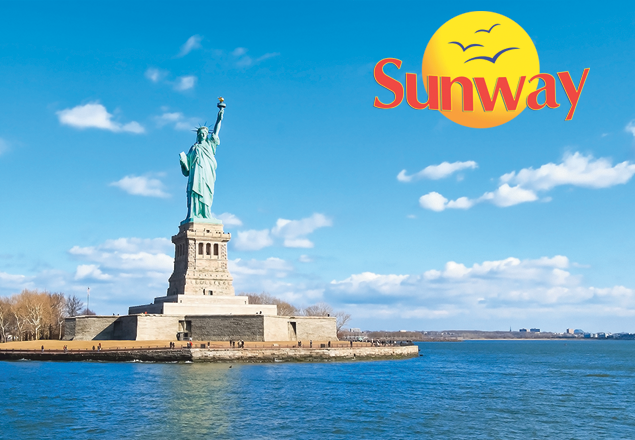 A Transatlantic Crossing from New York on this incredible ship is a holiday like no other! Queen Mary 2 offers exceptional dining, luxurious accommodation, world-class entertainment as well as so much space on board and an array of state of the art facilities including a 3D Cinema, planetarium and a superb spa. Todd English Restaurant: Speciality Mediterranean dishes such as Pumpkin Puree Love Letters and Porterhouse of Lamb. Designed by renowned Chef Todd English, famous for his restaurants in many U.S. cities. Golden Lion Pub: Darts, karaoke, live sports and ale – everything you’d expect of an authentic English pub. There’s even a traditional pub lunch served every day, with classic favourites such as fish and chips and cottage pie. Winter Garden: London’s famous ‘Kew Gardens’ is the inspiration for this quiet lounge themed on an English country garden. A unique indoor water sculpture and lush greenery brings the outdoors inside. Sip a mimosa while you enjoy the early afternoon art auction, or meet up with friends for an evening of drinks and soft piano music. Price includes cruise only on a full board basis in a Balcony stateroom, Government taxes & fees.